has bloomed and your Rosemary Tree has started to look sallow, what do you do with the plants? Here are a few tips on how you might keep those great gifts thriving throughout the New Year. Now we all know that one of the most popular plant gifts is the Poinsettia. (by the way, these are very poisonous if eaten, so keep them away from pets and children) I have to admit that they are lovely. I am one of those who throw the plant into the compost bin after the leaves start to fall and the bracts lose their color, but if you are feeling adventurous here are a few tips. When you bring your plant home, be sure to give it at least 6 hours of indirect sunlight each day, if the temps are comfy for you, then they are comfy for the plant. Water only when you feel that the soil is dry to the touch. Once the bracts have lost their color, (bracts are the colored portion of the plant, the actual flower is the yellow center) or you have lost most of the leaves, you can cut the plant back to about 8″. You will start to fertilize the plant with a balanced fertilizer, or liquid seaweed. You water as needed and continue this way until Spring time when you can place it outdoors in a low light, protected area. Continue fertilizing until you have new leaves which should show up sometime in late Summer if you are successful. Finally, the re-bloom process is a real science project, On October 1st, you begin to give the plant 14 hours of daily complete darkness. No street, or porch light, just black dark. This must be done until early November in order for then plant to produce new blooms. Personally, I haven’t been inclined to see if this works, but please respond to this post if you have. Another holiday favorite is a Rosemary tree. If you would like to keep your Rosemary in a pot, plant it into a larger pot filled with gravel at the bottom for good drainage. Be sure the bigger pot has a hole at the bottom. You can place all of this on a plant saucer to catch water, it doesn’t need much water to survive so be sure not to over water. Let the water run through the plant and out into the saucer (be sure to empty the saucer after a few moments). Every once in while, give the rosemary a “bath,” gently rinsing off any dead leaves and other debris (but not the soil!) Rosemary likes humidity, so spritzing the plant occasionally is a good idea. Unfortunately, the variety that is used for the tree is a dwarf that doesn’t really fair well here in Texas, so if your Rosemary doesn’t survive, use the dried stems for cooking and put the rest in your compost pile. You can always purchase a Texas friendly variety and add that to you landscape for future use. Next lets talk about the Christmas Cacti. These little jewels are a treat during the holiday’s with the lovely array of colors they come in and the showy blooms they sport, but this plant too has a trick to re-blooming. The website article entitled “Care of the Christmas Cactus Important After Holidays”, written by Rosie Lerner, Purdue Consumer Horticulture Specialist, and published by Purdue University, says the Christmas cactus can be placed outside in a partially shaded location during the summer. To avoid shocking the Christmas cactus, the same article says it should be gradually acclimated to indoor conditions before it is brought back inside at the end of summer. This can be done by bringing the Christmas cactus inside for a few hours each day and gradually increasing this time.To promote blooms, Lerner suggests placing Christmas cacti in locations ranging between 50 and 55 degrees Fahrenheit beginning in November. In addition, in order to bloom, they need several hours per day of complete darkness beginning around the middle of October. “Christmas Cactus” advises while the buds are developing, the Christmas cactus should be placed in a location that receives filtered light. At this point, it should not be moved. Now all that great advice in mind, I am the lazy gardener so I leave mine in a sunny window all year long, ignore it until the Fall when I begin to use seaweed fertilizer and right now mine is covered with blooms for Christmas. Proper watering is important to the successful growth of the Christmas cactus. “Care of Cactus in the Home” says to encourage buds to form, less water should be given in late spring.After the Christmas cactus has formed blooms, it will require regular watering. Lerner says even though the Christmas cactus is considered a succulent plant, it does not tolerate drought conditions very well. The best way to decide if the plant needs water is by feeling the soil. Christmas cacti can survive and continue producing spectacular blooms for many years. They often outlive the caretaker. A large, mature Christmas cactus will develop what appears to be bark, and is capable of producing hundreds of blooms. 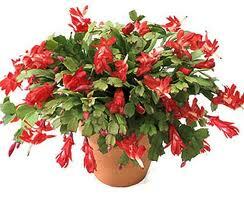 The extra care required by the Christmas cactus is well worth the effort. The brilliant flowers it produces is a wondrous gift to behold each holiday season. I have seen some people leave these outside on a morning sun exposure porch in large pots and only bring them in when it gets too cold outside. These really can get huge and the blooms are an array of pinks, white and reds that are quite spectacular. Now for those of you who are scratching your heads wondering how this doesn’t sound like a lot of work, I will confess, that it is and for some of my gardener friends who love a challenge, this can be some fun for you. For me, any plant that is enjoyed and appreciated , but when not successful goes back into the earth as compost as food for more plants, and not in the trash can, is a successful plant.